Welcome to my page, and Blessed Be! Rev. Lori Bruno has been featured on WCVB-TV’s (Ch 5) “Chronicle” program in Boston, MA, as well as other local and national broadcast radio, internet radio programs, and regional cable-access TV stations. She has consulted on the occult to numerous books including “Spectre” and “Fridays at 4:00 pm”. 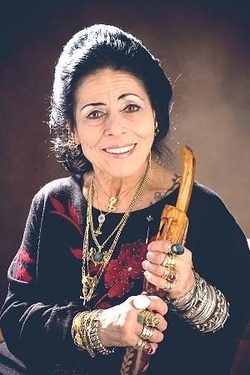 She was also interviewed in “People of the Earth” by Ellen Everett-Hoppman and has written for the “Llewellyn Magickal Almanac” and “Spell-a-Day” series, and has offered forwards to many books on the occult. She is the foundation persona for the character "Nana" in mystery novels by Patricia Cornwell. Some of her poetry is featured at this web site on the poetry pages. Lori was also a featured Reader and Lecturer at the former Eastover Resort in Lenox, Massachusetts on select theme weekends by arrangement. * Individuals & Groups may contact for appointments. * Groups by arrangement in your home or other location. * Fund Raisers, Harbor Cruises, etc. * Weddings & Commitment Ceremonies Available by appointment. For information, appointments call: 978-741-9297 ( message service available ). Note: Due to volume, some E-Mail is handled by my webmaster by arrangement. You may also use the contact form at this web site. You can also make an appointment with Rev. Lori Bruno to meet with her at her shop, Magika - Chapel of Archangel Michael in its new location. The shop is located in the historic McIntire district, a quiet neighborhood at the edge of the downtown district. The building now occupied dates back to 1880. It is also convenient to MBTA Bus and MBTA Commuter Rail service.